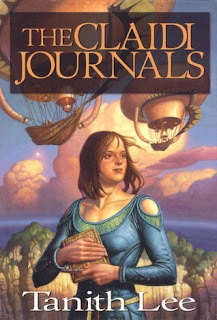 Claidi’s story is told through her journal. As a writing style I’m actually not always a fan of that type of telling, but for Claidi’s story it was superb. Just as it is impossible to read one of the books (or review one), it is also impossible to explain the full breadth of Claidi’s story. Set in a beautiful, magical, and harsh world, it follows Claidi, a young girl who is far more important than she might realize. There is intrigue and malice from the Houses, games and betrayals and heartbreak and so many other things that make this story a fascinating journey. It is a fantasy tale of great quality. I’ve always liked original worlds, and everything about this story is original. The characters are varied and very often surprising, with twists coming and snatching me along for the ride. Claidi is a wonderful heroine with a bit of a rebellious streak that often gets her into trouble, but then helps her get out of it. I would definitely recommend you read her journal. I remember reading these some years ago and really loving all the rich, varied settings the story took me through. Great fun.